Come and enjoy yourself in this luxury villa with private swimming pool on the Silver Coast in Óbidos! 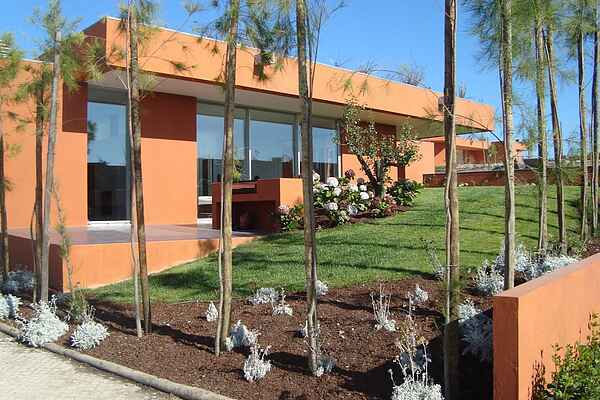 Through its location on the 18 hole golf course Bom Sucesso Design Resort, this villa is a lovely base for a family or golf holiday. The villa is architecturally constructed, stylishly furnished and equipped with all comforts for a relaxed holiday. Thanks to the many windows, the villa is very light. From the bedrooms with en suite bathroom you walk through the sliding doors to one of the terraces. You can also take a refreshing dip in the swimming pool. Even if the temperature drops, this villa is perfect. You can warm up in front of the wood stove separating the living room from the dining room. Guests can use the 18 hole golf course, the tennis and paddle courts for a fee, and in the summer there are special (sports) activities. The centre of the medieval fortified town of Óbidos is only 10 km away. The Óbidos Lagune is located approximately 5 minutes away and offers many water sport activities. A car is recommended to explore the region, such as the cosmopolitan resort of Cascais, the fishing village of Peniche and the resort of Nazaré. You can't miss out on a visit to the capital Lisbon (90 km).